People say Audi are the masters of four-wheel drive and the Q5 is a sporty, high-quality 4x4 SUV in typical Audi style. A more compact SUV than the ever-popular Q7. It sports a sleek and stylish design that puts it above its rivals as a better-looking SUV and is a serious performer on the used car market. You can pick up a used Audi Q5 for a great price with RAC Cars, where there are plenty of offers available. The Audi Q5 is quietly styled for a relatively big car and is a less chunky SUV that oozes style. Inside the cabin is resolutely Audi, with the confidence of restrained luxury and superb build quality. It’s spacious and practical, with the rears seats folding to give you loads of space or reclining for more comfort. If you opt for an Audi Q5 SE, you can get a banging 10-speaker stereo and quality leather upholstery throughout, climate control and parking sensors. With an S model, you get all that good stuff with the addition of sports-tuned suspension, sports seats, Xenon headlamps with LED running lights and a raft of exterior styling. Unusually for a 4x4, the driving experience is one of the big pluses for a second-hand Audi Q5. It is a spirt drive that handles well and boasts little body roll. Although you get all that road presence and excellent visibility from the SUV driving position, it feels a lot like an Audi saloon behind the wheel. The Quattro system delivers permanent four-wheel-drive, but it’s intelligent enough to sense the road surface and deliver more or less power to the front and back wheels. 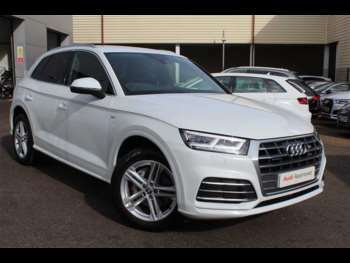 Explore RAC Cars range of used Audi Q5s today!